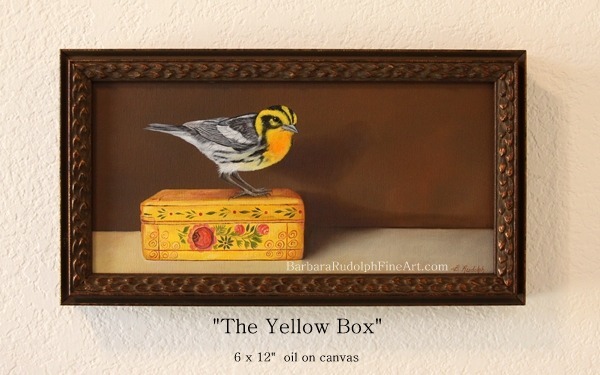 "The Yellow Box" is a brand new oil painting of a "Blackburnian Warbler." 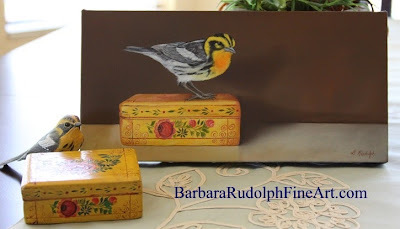 I think "warblers" are all beautiful, however this painting was inspired by an old wood carving of my late father's and a little "yellow box" that I have had laying around for many years. The colors in the "bird" fit in nicely with the color of the little box from Mexico. I sometimes like to set up my still life arrangements a bit off centered. I actually prefer them this way because I feel like it helps create a certain "mood" to the painting. I paint in a cast shadow coming from the main objects in my painting to create the illusion of space. I also take lots of pictures of my arrangements first then have a look at which one will work the best for the composition. "The Yellow Box" is as simple of an arrangement as you can get, but I really love the finished look of a simple arrangement as much as my more complex paintings. I have a few shows coming up this fall and winter, so it will be available for purchase. I may do some prints of it too. Here is some information about "Blackburnian Warblers" too. It was taken from the "All about Birds" webpage. You can visit their link below and then even here the lovely sound this bird makes. A bird of the coniferous forests of the Northeast, the Blackburnian Warbler is breathtaking in its brilliant orange-and-black breeding plumage. Breeding (Alternate) Plumage: Throat and upper breast deep orange. Sides of neck, eyestripe, line on forecrown, and eye arc yellow-orange. Face patch, crown, and back black. Lower breast yellowish with black streaks on sides. Belly white or yellowish. Wings black with broad white wingbars that run together into a white patch. Back black with two creamy white lines. Tail black with large white patches in outer tail feathers. Nonbreeding (Basic) Plumage: Similar to breeding, but oranges less intense and more yellow. Olive edges to black back feathers. Wingbars more distinct and less of a continuous white patch. A bery cute bird painting barbara,its a curious combination with this little box!.